If you wish for your name and donation amount to not be made public, please select anonymous when completing your donation. Please join me as I help my friends at McDonald’s® Durham Region raise $500,000 to help build and support a New Grandview. My passion with Grandview started in the mid 90’s when I started emceeing various charity golf tournaments in support of Grandview. I was curious about the organization so I decided to take a tour of the facility to learn more. That is when I first heard about the hundreds of kids on a wait list needing physical & communication therapy. Right then and there I knew I needed to help. I joined Grandview Children’s Foundation Board in 1998 for a 3 year term. From there I eventually accepted the roll of Chair followed by honorary director more than a decade later. Grandview Kids is the only Children’s Treatment Centre in Durham Region providing life-changing outpatient treatment, rehabilitation services and more to children and youth with physical, communication and developmental needs and their families. Built in 1983, Grandview’s main site in Oshawa was designed to serve 400 kids annually. Currently, the demand for Grandview exceeds 10,000 children and youth with more than 3,300 kids waiting for services. The families of Durham Region desperately need a New Grandview. In Autumn 2018, Grandview Children’s Foundation announced the launch of our $20 million ‘Believe’ Campaign to support services and construction costs for a new Grandview headquarters to be built in Ajax. The new centre is scheduled to open in 2022. For the first time ever….all 24 McDonald’s® restaurants in Durham Region have joined forces to raise funds through McHappy Day® to help Grandview Kids. 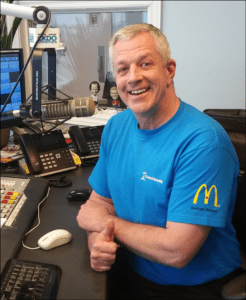 Wanna do your small part to help ramp it up for McHappy Day® May 8th?